Last night, Melanie and I made our yearly trek to a reasonably dark place to watch the Perseid meteor showers. The sky was moonless with the only significant light pollution coming from the city of Erie in the east. We camped at a marina, so there were a few parking lot lights in the distance, but not in the direction of the meteors. It was nothing special. We set up our camping chairs (very comfortable) at around 11:30 PM and stared at the sky until a little after 1:00 AM. Unlike last year when we saw a couple really impressive fireballs, nothing remarkable appeared this year. I counted about 15 total. 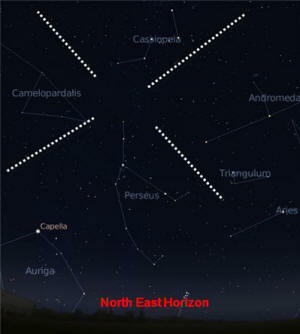 With one exception, all the meteors were bonafide Perseids since their trails originated in the predicted direction of Perseus (see map below). If the radiant point were to be any farther away from Perseus, they would be called the Cassopeian Meteors. At our 42.1° latitude, at this time of year Perseus is only about 20° up from the horizon around midnight. As usual, even if the meteor shower experience is disappointing, the opportunity to get reacquainted with the starry sky is utterly welcome. My house is surrounded by tall tress, so the observing is lousy from the yard. Nearby trains shake the ground and planes from the airport constantly fly through the space, so nobody would ever consider establishing a serious observatory here; astrophotography is out of the question. It is amazing how far the train horns travel all the way to the lake shore - a mile away and 100 feet below the track elevation (they blow those *@^%# horns all night long). But I digress. Because the sky was unobstructed by cloud or haze cover, and because the moon had not yet risen, an excellent view of the Milky Way was provided. A tree line prevented seeing the more southerly constellations and stars, but everything to the north was there in full splendor. Although I religiously read Sky & Telescope magazine every month and review the sky charts in a desperate attempt to prevent all aspects of my once heavily pursed hobby from being lost, it takes actually getting out and observing to refresh the image on my mind. I rely heavily on the oft-used little sayings to help me find my way around the night sky, like "Follow the arc to Arcturus," and then, "Speed on to Spica." The former refers to continuing the arc of the handle of the Big Dipper (an asterism, not a constellation) on down in to the constellation of Boötes , where the bright red star Arcturus resides (3rd brightest star in the northern sky). Then the latter instructs to keep going in the same arc until you find the bright star Spica in the constellation of Sagittarius (bluish-white, 15th brightest in the northern sky). Cygnus the swan's bright star Deneb (meaning tail) easily identifies the constellation that is said to be "Flying down the Milky Way" because it stretches directly along the thickest part of our galaxy's milky white background haze of stars. The Summer Triangle, composed of Cygnus' Deneb, the bright star Vega in Lyra the lyre, and Altair in Aquila the eagle, was a sight to behold against the backdrop of the Milky Way. Once Pegasus and Andromeda had climbed out of the city light, the binoculars easily fond the Andromeda Galaxy - always an awesome sight. It all brings back memories of when I would climb through the access hatch to the roof of barracks at Robins AFB, in Georgia, when my interest in astronomy was first kindled, and use my star maps to learn the night sky. Unlike up north, from Georgia I could see a few of the southern constellations. I really wanted to catch a glimpse of the Magellanic Clouds (Large or Small), but they were just too close to the southern celestial equator to see. I'll have to settle for pictures since I doubt at this point in life I will ever find myself below the Equator. So, overall it was a good night. Next year I vow to take a pizza with me and spend more time.